Make any holiday event festive with the Holly Table Runner. The Holly Table Runner is food-safe, using 30% recycled paper and soy-based inks. Just cut the paper off the 20" by 25' roll to fit your table. • Food-Safe • 20" x 25 Feet • Soy-Based Ink • 30% Recycled • Disposable See a complete description and more specifications below. 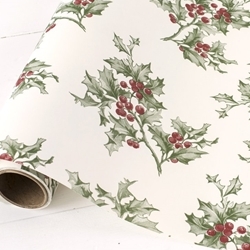 Entertain and decorate your table in classic style with this festive kitchen paper. This table runner features a traditional green holly with red berries and provides a quick and easy decorative theme across all your tables. Use it to identify seating assignments instead of table tents and to decorate individual place settings. Paper runners are great for decorating tables, gift wrap, flower wrapping, wallpaper and lining shelves or cabinets.